Healy Awards – October is Breast Cancer Awareness Month – Raise Awareness Today! 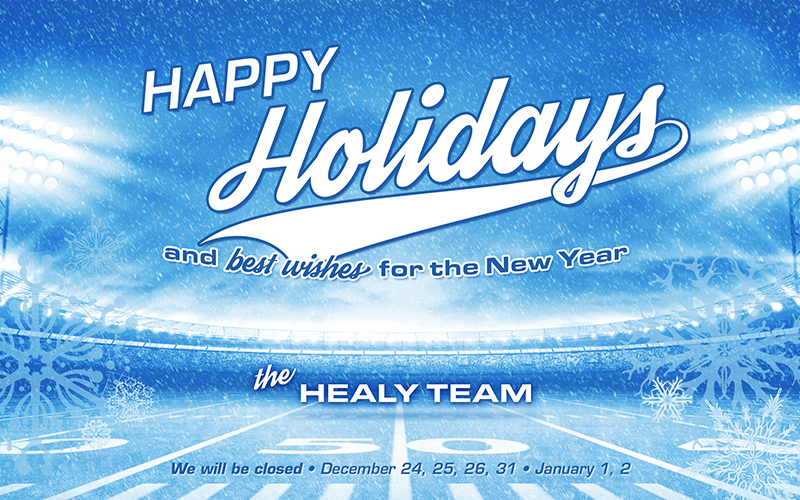 Healy Awards – Extended Business Hours – Order Today! 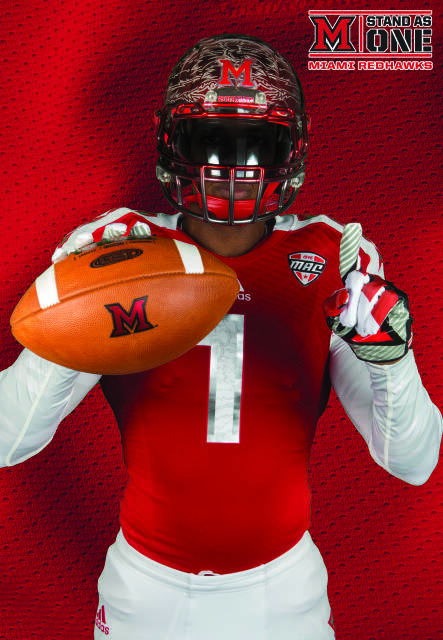 Healy Awards – Order Your Football Team’s Decals Today! Healy Awards – Order your Decals and Awards Today! 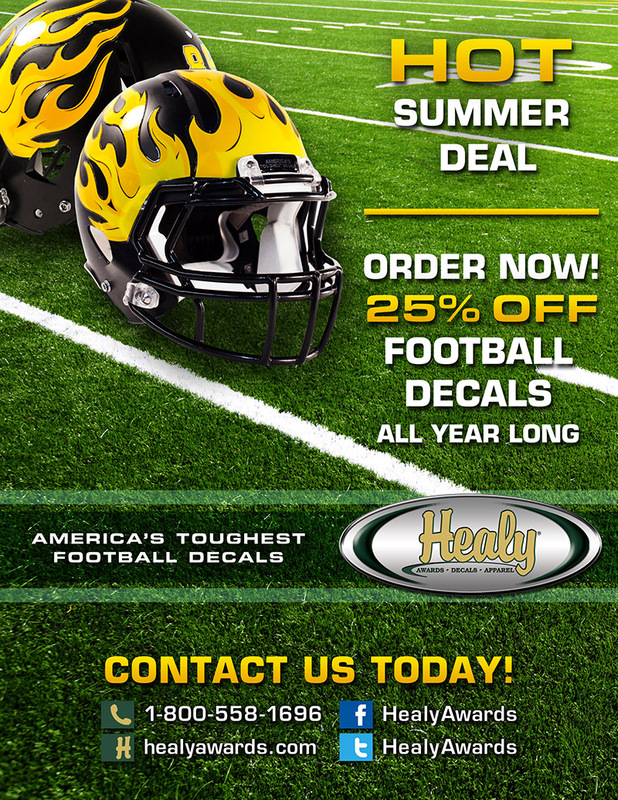 Did you recently order Half Helmet Football Decals from Healy Awards? If so, these easy to read instructions will help when applying your team’s decals to your football helmets. Step 1: Before peeling the decal off its back liner, cut around the outside of the entire decal (1/4″ around outside printed areas of shape – leaving a clear vinyl border of 1/4″ around the outside). Step 2: Remove the excess clear vinyl from the inside and outside areas as you apply the decal. Step 3: Remove a small portion of the back decal liner. Step 4: Press down a small portion (non-printed area) of the decal to the helmet for position prior to applying. Step 5: Apply decal from top to bottom removing the liner backing while pressing decal sections into place. Apply sections a little at a time. 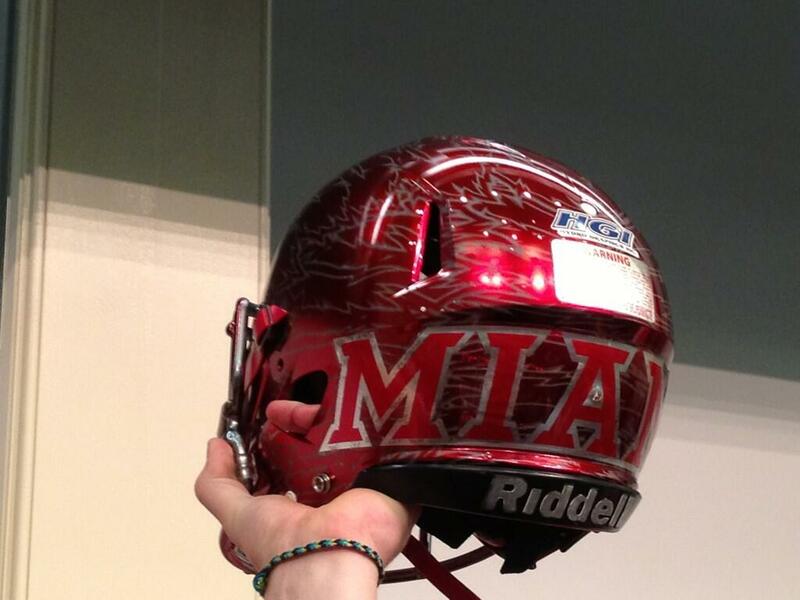 Step 6: Press down the printed decal sections to helmet several times. Step 7: Cut out any overlapping vent areas or snaps with a razor blade. Step 8: Repeat steps for opposite side of helmet. 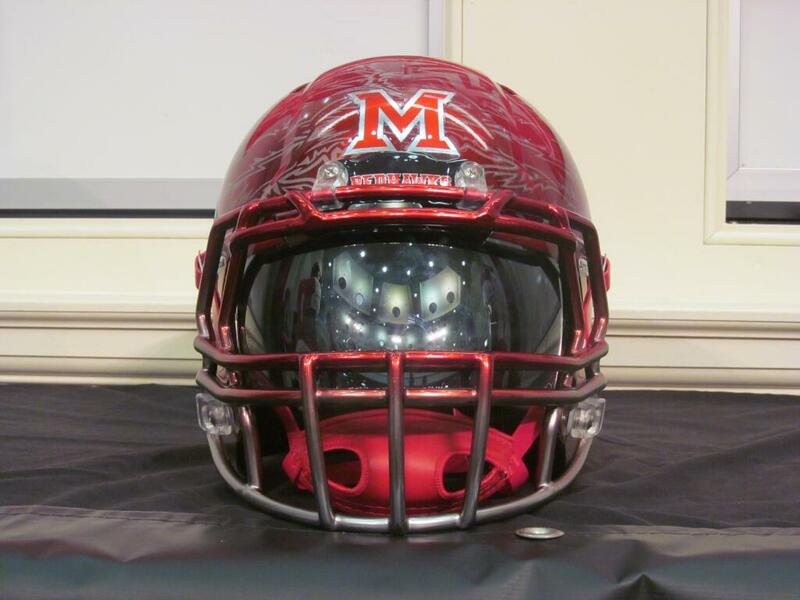 Step 9: You have successfully applied your half helmet decals! 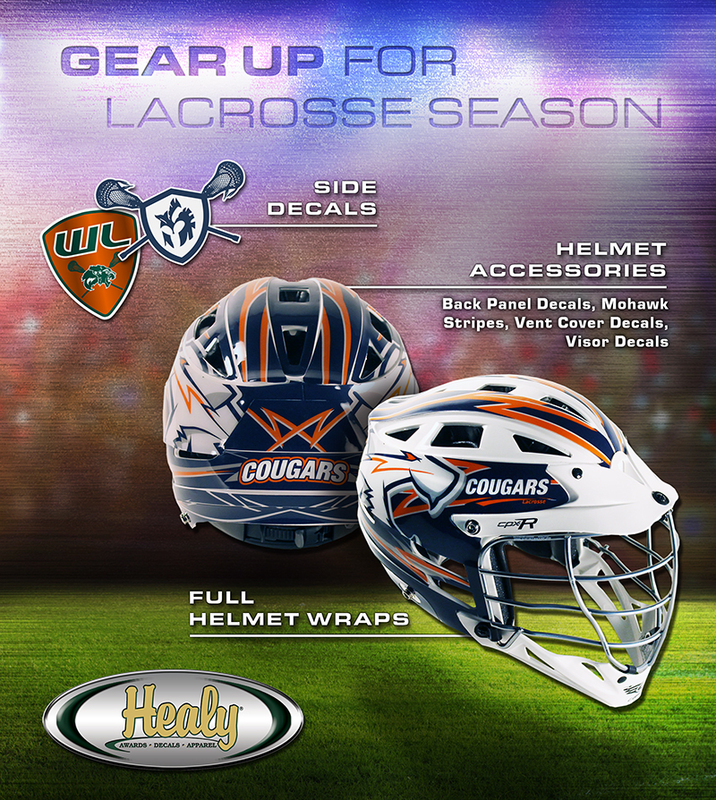 Healy Awards – Design Your Next Helmet Decal Today! 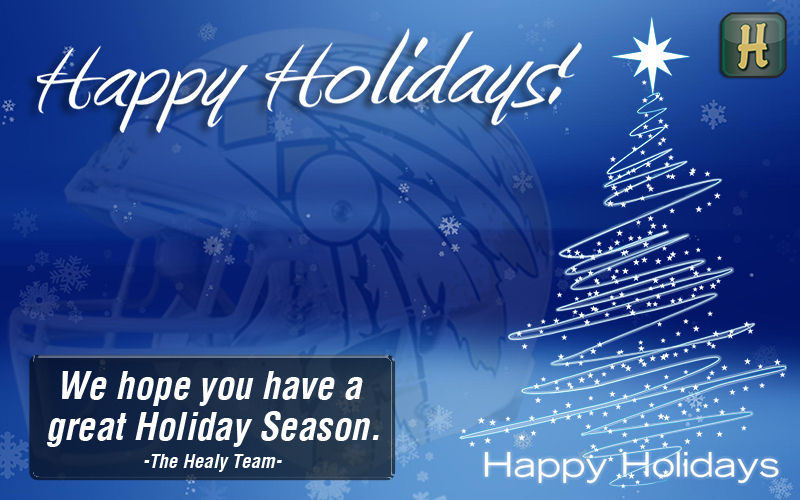 Happy Holidays from All of Us at Healy Awards! Healy Awards – Check Out These Great November Products! Healy Awards – Go Mini! 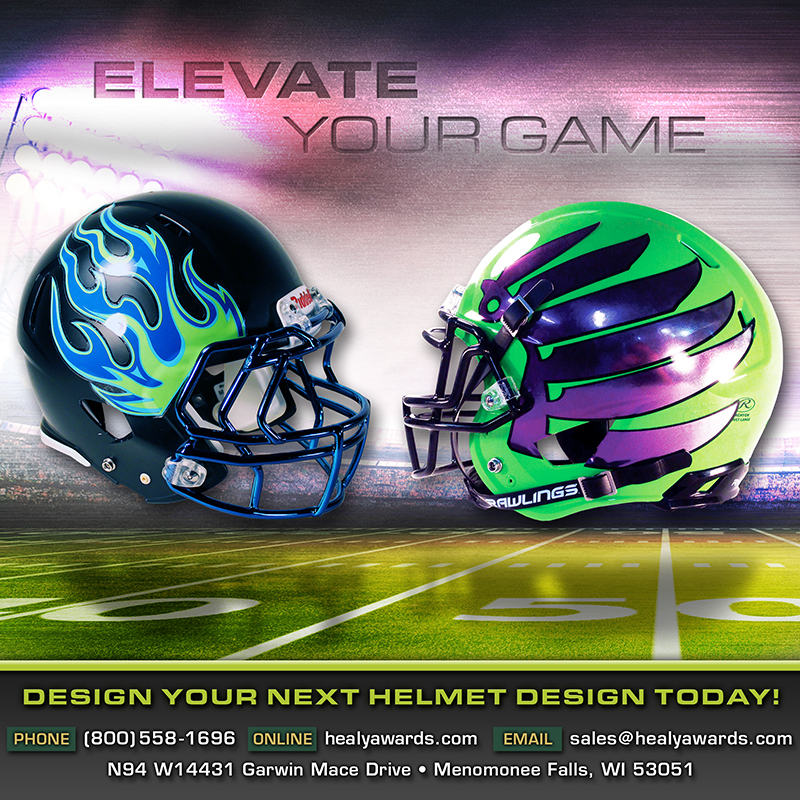 Order Custom Mini Helmets Today! Healy Awards now provides complete Mini helmets as replicas of your full size helmets. These are perfect for end of season gifts. 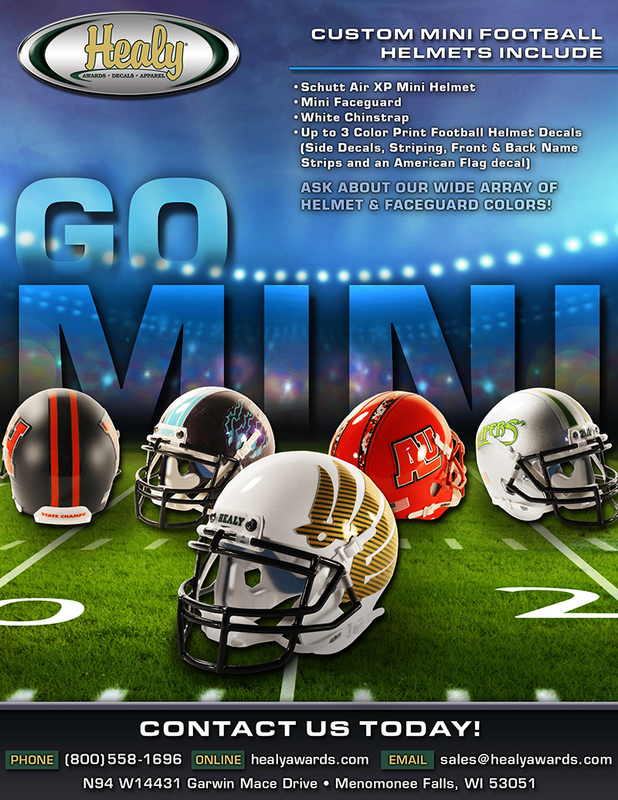 Each Custom Mini Football Helmet includes a Schutt Air XP Mini Helmet, a Mini Faceguard, a White Chinstrap and up to 3 Color Print Mini Football Helmet Decals (Side Decals, Striping, Front & Back Name Strips and an American Flag decal). October is Breast Cancer Awareness. 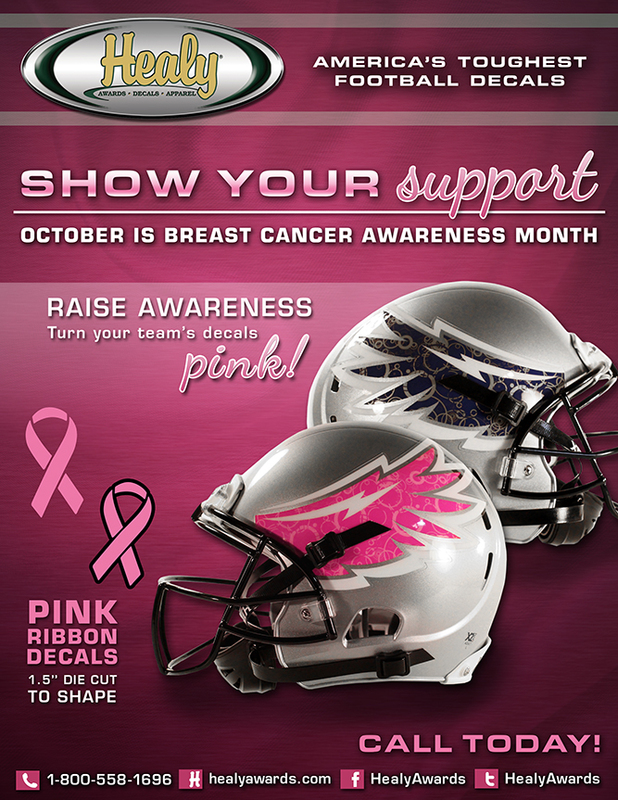 Show your support and raise awareness by turning your team’s football helmet decals PINK! Call or email us today to get artwork started! Healy Awards – There’s Still Time to Order! 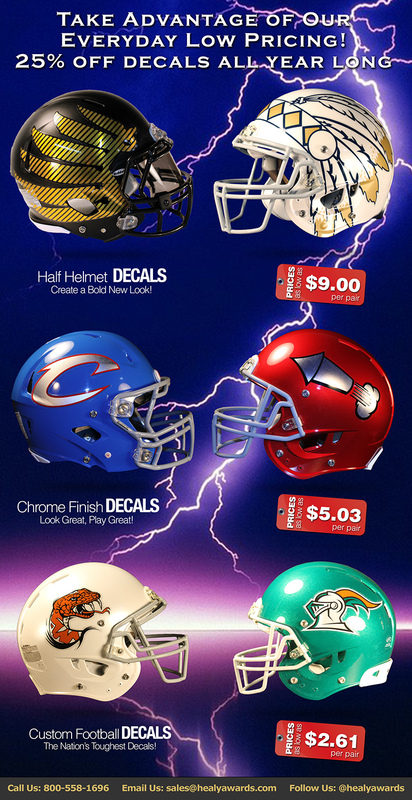 There’s still plenty of time to order your team’s football helmet decals for the 2014 season. Give us a call today at 800-558-1696 to place your order. Rush orders are available. 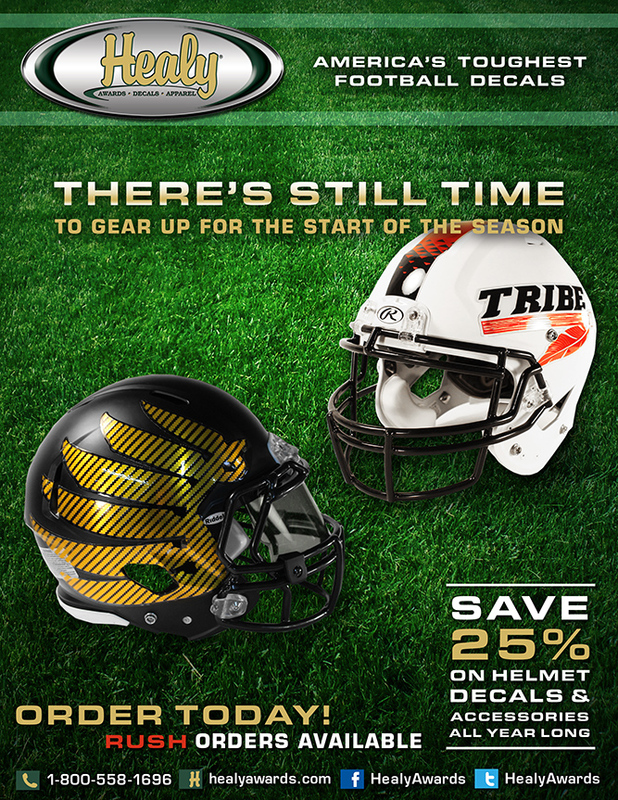 Give us a call to take advantage of our 25% off discount all year long on decal and decal accessories. 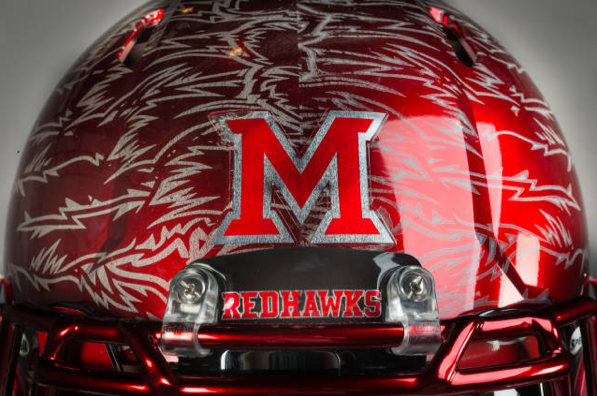 Now’s the time to create a new identity for the upcoming season, or re-order a past football decal design. 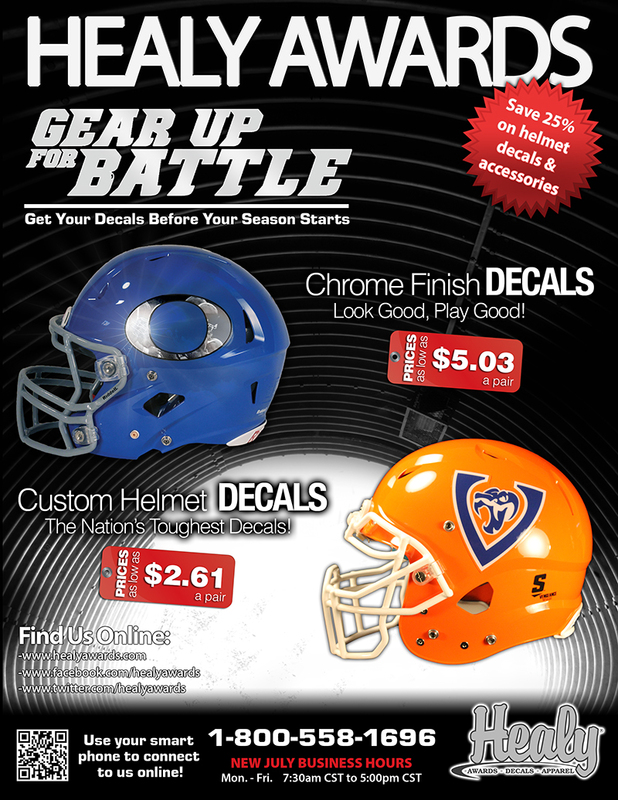 THE NATION’S TOUGHEST MOST DURABLE FOOTBALL HELMET DECALS! Give us a call today to take advantage of our 25% off discount all year long. 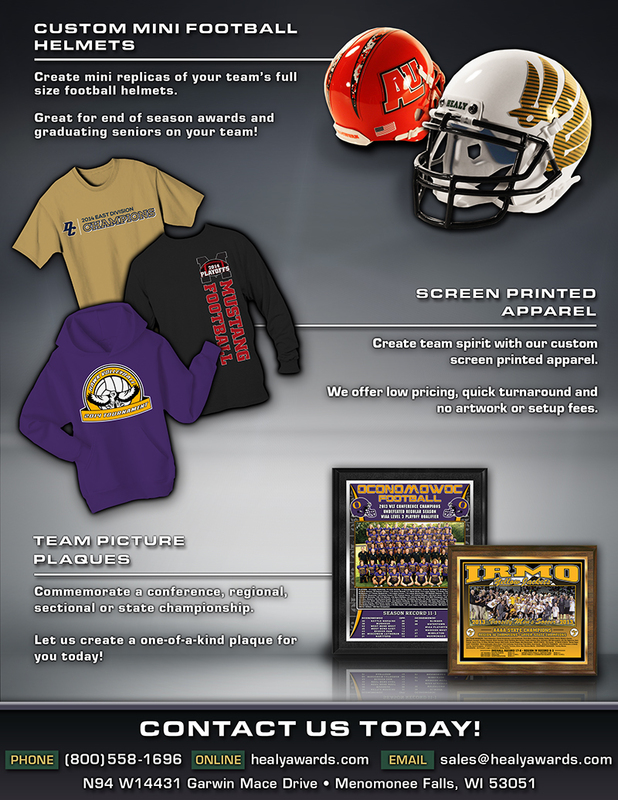 Now’s the time to create a new identity for the upcoming season, or re-order a past football decal design. Healy Awards – Happy 4th of July!!! Happy 4th of July…Enjoy the upcoming Holiday weekend! 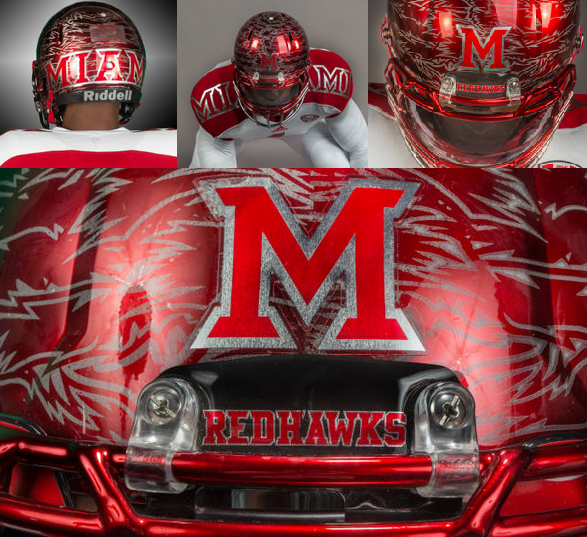 If you haven’t ordered your football decals yet for the 2014 season, call us today to take advantage of our 25% off decal discount. 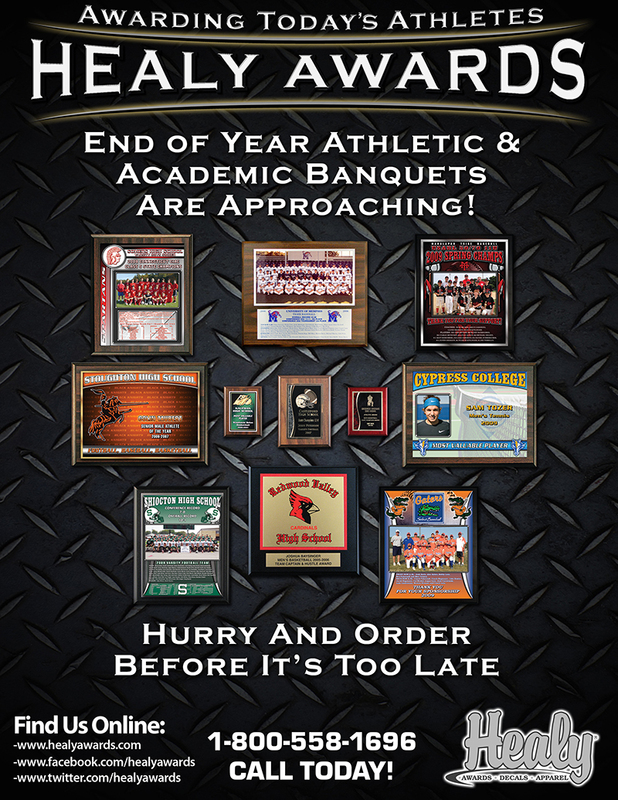 Healy Awards – Order your Awards & Decals Today! Healy Awards – October is Breast Cancer Awareness Month! October is Breast Cancer Awareness Month! 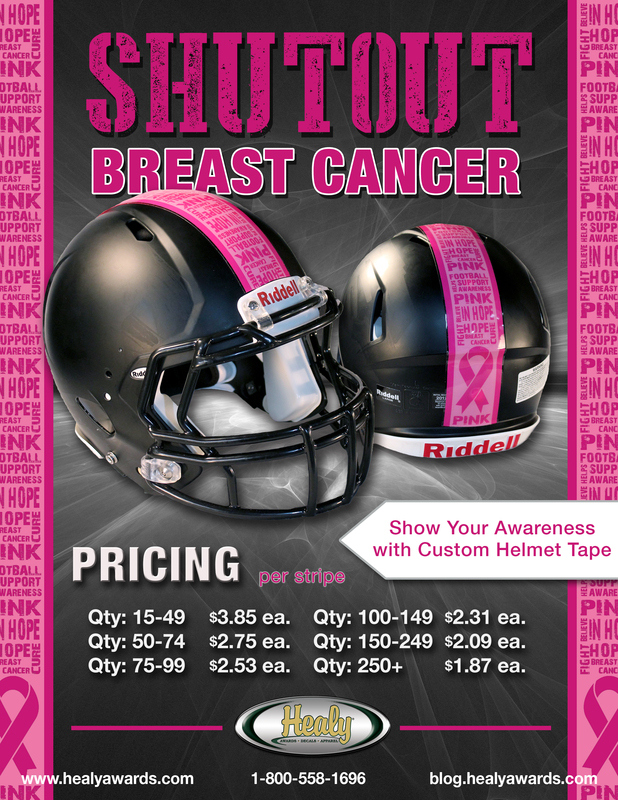 Show your awareness and support and help shutout breast cancer. Please call Customer Service at 800-558-1696 to place your order today. Healy Awards – Order your football helmet decals today. It’s not too late! Football practice has started in many areas across the United States. 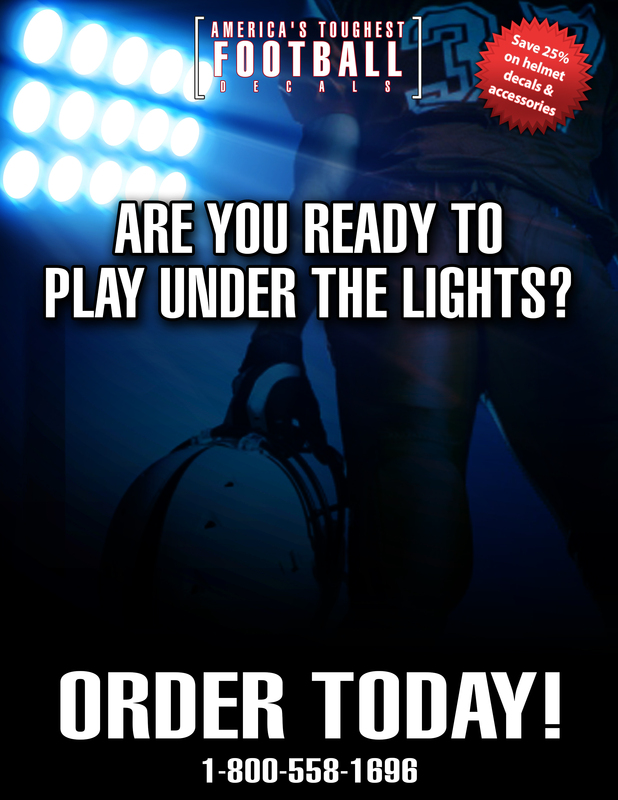 Are you ready for your season? Order your team football decals today by calling us at 800-558-1696, visiting us online at www.healyawards.com or by emailing us at sales@healyawards.com. 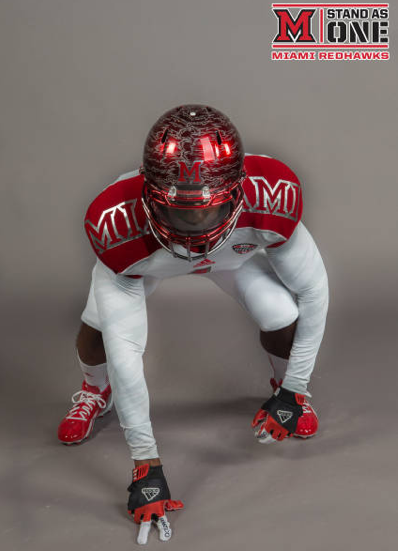 The Miami (OH) University Football program released their new look for the 2013 season which celebrates the 125th year of football at the University on Wednesday, July 24th. 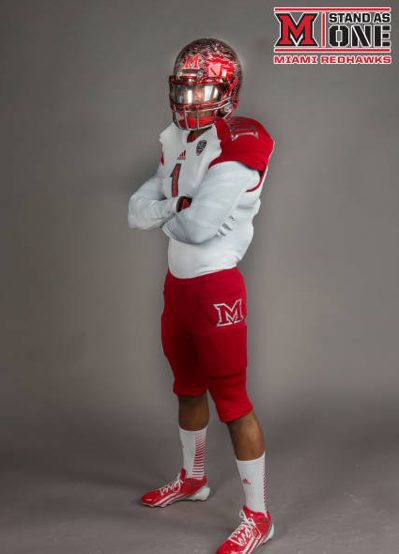 Echoing the Miami University Alma Mater of celebrating its tradition while embracing the future, Miami University Athletics unveiled new football uniforms, helmets and decals that include cutting-edge developments in apparel technology from adidas, helmets from Hydrographics and decals from Healy Awards, Inc. Read more about the unveiling at the following link: Miami Unveils Bold New Football Uniforms. Order Your Football Helmet Decals for the 2013 Season! 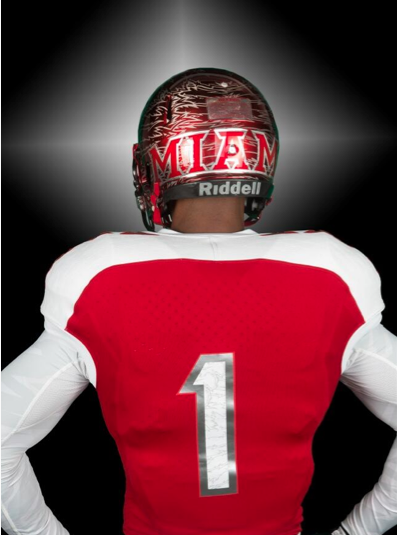 Order Your Football Helmet Decals for the 2013 Season! Visit our website at www.healyawards.com, email us at sales@healyawards.com or call us at 800-558-1696. 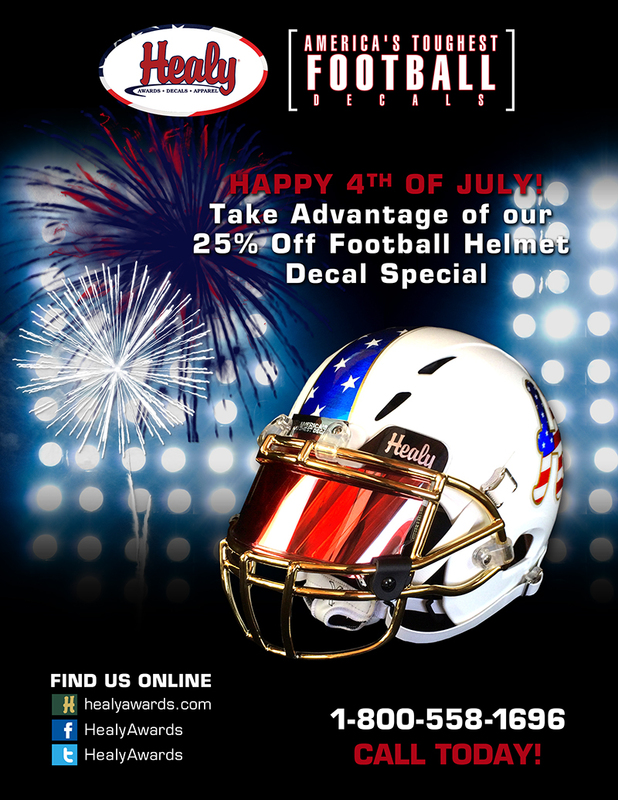 Healy Awards is a top provider of football helmet decals to youth leagues, high schools, colleges and professional organizations across the nation. 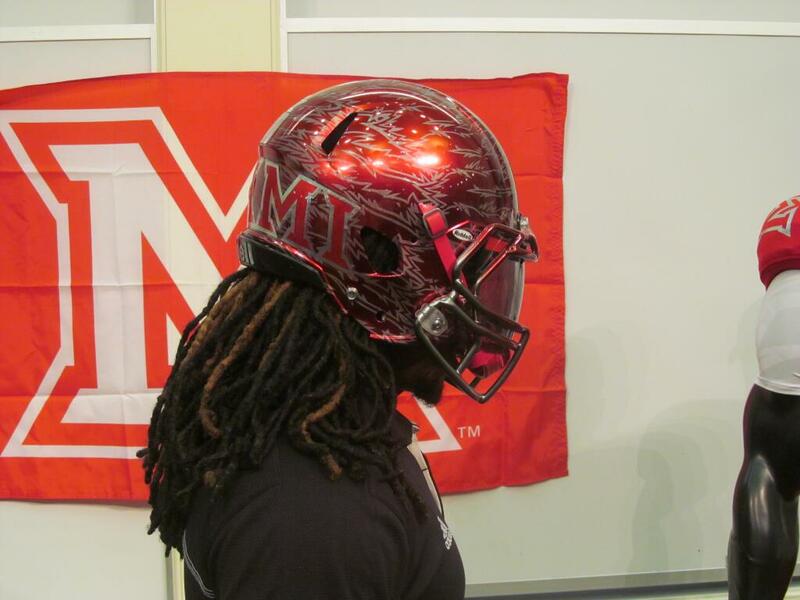 We have the Nation’s toughest most durable football helmet decals.